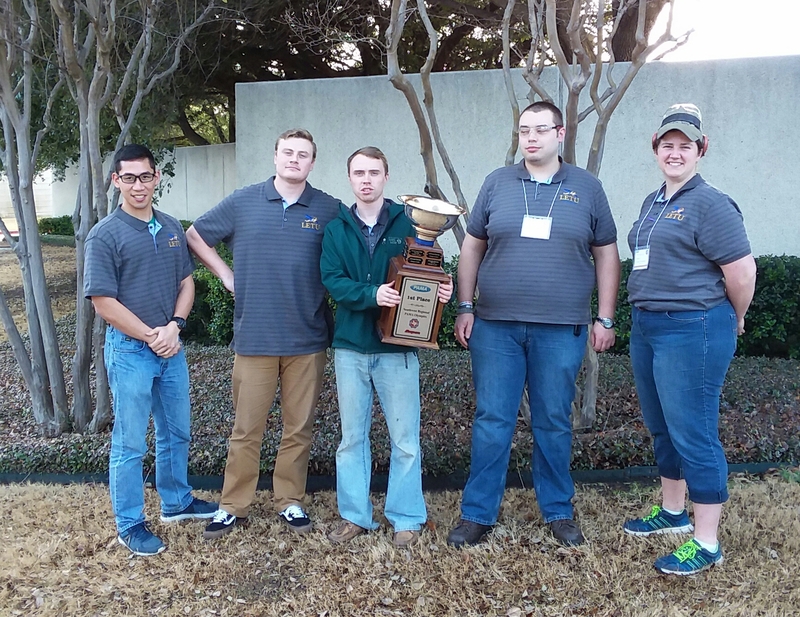 LeTourneau University aviation students placed first and third individually and won first place overall for the school when they competed Feb. 24 at the Dallas-Fort Worth Professional Aviation Maintenance Association competition. Jake Ribbe, senior aviation maintenance student from Eagle River Wisconsin, won 1st place overall and Bob Kuipers, senior aviation maintenance from Holland, Michigan, won 3rd place overall. Other competitors included Rebekah Martel, senior mission aviation student from White River Junction, Vermont; Nate Goulet, senior aviation maintenance student from Escondido, California; and Poom Padmanuja, senior aviation maintenance and aviation management student from North Richland Hills, Texas. The team was coached by David Tesser and Abigail Kutz. The students competed against several other aviation maintenance technology schools in Texas and Oklahoma. "We are so very proud of our students and the excellence they exhibited at the PAMA competition," said Fred Ritchey, dean of the LETU College of Aviation and Aeronautical Science. The competition required intense concentration. Students were required to complete maintenance tasks similar to those they would encounter in their careers as Airframe and Powerplant (A&P) mechanics. The students were graded on safety wiring, torque procedures, riveting, and precision measurement. They rotated to a dozen different stations with only 20 minutes per station and were graded by judges who were from the aviation industry or aviation education. Individual scores were based on the final product, but also on safety and tool management, which meant organizing their tools and discarding debris. This is the 9th year LETU has competed in PAMA competition. "These 5 students worked extremely hard preparing for and competing in this competition. They were able to showcase their skills in real world aviation situations and show the love of Christ while doing so." Our graduates are masters at welding, metalwork, reciprocating engines, turbine engines, propellers, fuel systems, electricity, machining, and more!